A STUNNING drive from a mechanically-plagued Daniel Ricciardo has gifted the Aussie Formula One superstar his second win of the year with a gutsy win at Monte Carlo. The 28-year-old Red Bull felt his power sapping early in the piece but used the narrow streets of Monaco to his advantage as he fended off Sebastian Vettel hot on his tail. Daniel Ricciardo will start on supersoft tyres. Daniel Ricciardo won his first race starting from the top three with a stunning performance under the pump to cross the line over seven seconds ahead of Ferrari rival Sebastian Vettel. A mechanical issue early in the piece thwarted his power, but the Aussie was able to capitalise on the narrow Monte Carlo circuit to stave off the German for the remainder of the race. "I don't know how you did that, Daniel, incredible," Red Bull's Christian Horner said. Ricciardo later revealed he only used six gears after the initial radio message from Red Bull confirmed he would be driving with a faulty car for the majority of the race. Sky Sports commentators guessed the Perth product was racing with roughly 25 per cent less power for over half the race. "I think I can show emotion today," an elated Ricciardo said. "This is two years in the making so I finally feel like the redemption has arrived. "We had problems. We had a lot to deal with during the race. I felt a loss of power and I thought the race was done. I got home just using six gears. "Thanks to the team. We got it back. I'm stoked. "There were a few doubts that came in mid-race but ... we won Monaco. It feels good." It was later revealed Ricciardo was racing without a functioning MGU-K unit, an electric motor that is connected to the petrol engine and recovers energy that is normally lost in heat during brake phases. Charles Leclerc smashed into the back of New Zealand star Brendon Hartley in the 73rd lap after a suspected brake failure, sending debris flying through the air and brought on a virtual safety car. The brief moment of respite gave Daniel Ricciardo a handy breather with the final 5 laps looming. On the restart, the Aussie was able to get a solid boost ahead of Sebastian Vettel on his tail and claim a six second lead. "I've got it, buddy," a cool Ricciardo said with three laps left. "I would imagine Daniel Ricciardo is smiling just a little bit more now," David Croft said. A start at the back of the grid left little to no expectations on Max Verstappen's shoulders after a horror crash before qualifying left his weekend in tatters - but the Dutchman wasn't keen on leaving Monaco in the double figures. By the 60th lap, the 20-year-old Red Bull had made his way to ninth place ahead of Carlos Sainz as teammate Daniel Ricciardo fought off Sebastian Vettel with a power issue. His aggressive charge saw him pip the fastest lap of the race with a slippery 1.14.260 time. It was all going well for Daniel Ricciardo before he found Sebastian Vettel on his tail. In the 30th lap, the Aussie sent a haunting message to his team over the radio. "I'm losing power and losing gear sync," an audibly deflated Ricciardo said. When asked if the problem could be fixed before the chequered flag, a swift reply of "negative" came from his Red Bull engineers. 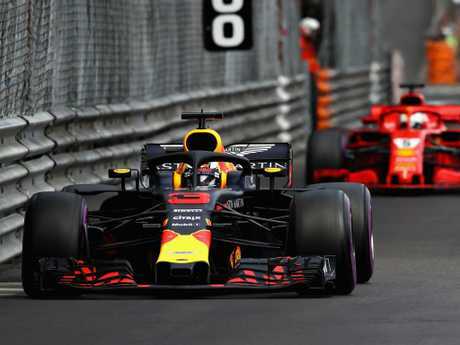 With overtaking opportunities next to nil in Monaco and 46 laps to go, a gruelling struggle faces Ricciardo as he tries to stave off Vettel before the final turn. Lewis Hamilton is also in the mix as the Englishman came within sniffing distance of the top two. "What will spur Hamilton on is that he can now see Ricciardo and Vettel on the pit straight," Brundle said. "He can see the enemy, he's faster than them and he will begin to understand that while he's struggling, others are struggling more." Fears for Ricciardo's tyres began to arise as the final 30 laps dawned. A pit stop would see his lead lost for good, but a blown tyre would be the worst possible finish to a perfect qualifying weekend. Daniel Ricciardo would have been dreading fate after a horror pit stop in 2016 cost him a chance at Monaco glory. Luckily for him, his jump to the pit lane went as smooth as possible and left him returning to the race with his first place unscathed. It followed a flurry of pits from Ferrari and Mercedes to switch out their tyres. Lewis Hamilton pitted from third early in the piece and opted for ultrasofts, and Sebastian Vettel followed suit soon after. The fresh change allowed the German to close the gap between himself and Ricciardo down to 2.5 seconds by the 21st lap. Despite having defending Monte Carlo winner Sebastian Vettel hot on his tail, Daniel Ricciardo got off to what Martin Brundle described as a "perfect" start to the Monaco Grand Prix. Continuously bettering his fastest lap, the Aussie made clean work of the claustrophobic conditions and snagged a comfortable one-second lead over the German by the end of the first lap. By the 12th lap, the Aussie had over seven seconds between him and Fernando Alonso in seventh. Down the other end of the pack, Max Verstappen made quick work of the low hanging fruit and worked his way from 20th to 16th with relative ease. Racing great and Sky Sports veteran Martin Brundle has showered praise on Daniel Ricciardo after a stellar qualifying weekend put him in the box seat to claim his second win of the year. Brundle claimed the 28-year-old Perth product was in the league of heavyweights and four-time champions Sebastian Vettel and Lewis Hamilton. "He's certainly of that ilk now, and you've got to include him in those conversations when you're talking about who's the best driver on the grid," Brundle said on Sky before the race. "He's the best overtaken on the grid, bar none, and by some margin I would say. He's delivering the pace and he probably hasn't had as many pole positions as he would have liked and deserved, but he's never had a dominant car in qualifying. "He stays out of trouble in the race, and he's the real deal. This track owes him a victory." It’s already been a forgettable weekend for Max. 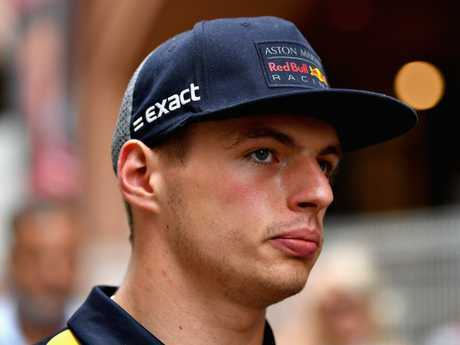 As if Max Verstappen's trip to Monte Carlo couldn't get worse, the fiery 20-year-old has been slapped with a penalty for changing his motor generator unit-kinetic (MGU-K) after a horror crash in the lead up to today's race. It is the third time the Bulls have been forced to switch out the unit, surpassing the FIA's restriction for two changes a season. While the Red Bull youngster can't sink further down the grid with the penalty, a third MGU-K this early in the season can only mean bad news with 15 races left in the year's fixture. Red Bull adviser Helmut Marko shared some sage advice for the uncompromising star after his blowout over the weekend. "Max has to learn not always to drive flat out. This one was unnecessary. He needs to be more patient, judge the situations better," Marko said. Formula One's governing body has cleared Ferrari of any suspicion of cheating after rivals questioned the Formula One team's energy recovery system. The International Automobile Federation (FIA) had been investigating after Mercedes and Red Bull raised concerns about what Ferrari were doing. FIA race director Charlie Whiting said on Saturday that Ferrari's system was more complicated than that used by rivals but he now accepted everything was aboveboard. "We had some concerns in Baku (at the Azerbaijan Grand Prix in April) that were difficult to explain and we worked through it with them," said Whiting at the Monaco Grand Prix. "(The rule book) says that it is the duty of the competitor to satisfy the FIA that their car complies at all times and they were having difficulty satisfying us," he added. "Here, we are now satisfied." Whiting noted that a senior Ferrari engine designer had moved to Mercedes this season and said former Ferrari technical head James Allison, now in a similar role at Mercedes, had raised concerns. "The matter was exacerbated by unsubstantiated speculation that went through the paddock like wildfire," said Whiting. He said any information that might have travelled from Ferrari to Mercedes was likely to have been outdated. The controversy burst out into the open on Thursday, when the official Formula One website reported that the FIA had asked Ferrari to "run an extra piece of hardware" so they could monitor the system. The website suggested rivals had expressed concerns Ferrari might be boosting energy flow beyond the permitted limit. Who’s better: Ricciardo or Verstappen?